LOOKING FOR THAT NEXT UNIQUE RARE ITEM? 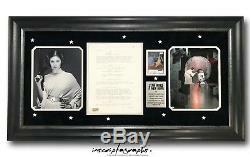 CARRIE FISHER OWNED STAR WARS: A NEW HOPE ORIGINAL FRAMED SCRIPT PAGE! THIS IS YOUR OPPORTUNITY TO OWN A VERY RARE PIECE OF STAR WARS HISTORY!! AS DIE HARD STAR WARS COLLECTORS & FAITHFULS KNOW, MEMORABILIA FROM ANY OF THE MOVIES IS HIGHLY COLLECTIBLE AND ANY SORT OF MOVIE PROPS OR PERSONAL ITEMS THAT HAVE DIRECT RELATION TO STAR WARS MOVIES AND OWNED BY EITHER THE MAIN ACTORS OR PRODUCERS ARE ALMOST IMPOSSIBLE TO FIND! 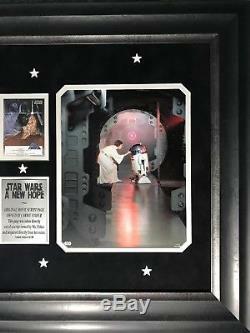 GEORGE LUCAS WAS NOT BIG ON KEEPING MOVIE PROPS FROM HIS STAR WARS MOVIES SO THERE ARE NOT MANY OUT THERE IN EXISTENCE WHICH IS WHY UNIQUE PIECES LIKE THIS ARE SO HARD TO FIND AND RARELY HIT THE OPEN MARKET. NOW IS YOUR CHANCE TO OWN A PIECE OF CINEMATIC HISTORY! 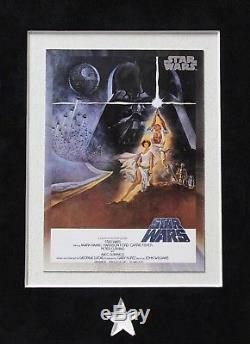 THIS COLLAGE FEATURES AN ACTUAL SCRIPT PAGE FROM A "STAR WARS: A NEW HOPE" MOVIE SCRIPT PERSONALLY OWNED BY ACTRESSES CARRIE FISHER WHO PLAYED PRINCESS LEIA IN THE MOVIE SERIES!! 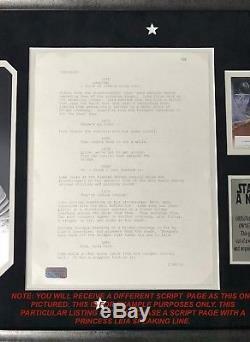 THE SCRIPT WAS PROCURED DIRECTLY FROM CARRIE FISHER & DEBBIE REYNOLDS' (HER MOTHER) ESTATE AFTER HER DEATH AND THIS MARKS THE FIRST TIME EVER, YOU CAN OWN AN ACTUAL PAGE FROM HER STAR WARS SCRIPT!!! THIS FRAMED COLLAGE IS LIMITED TO ONLY 100 EVER MADE AND NO MORE WILL EVER BE PRODUCED, ONCE THEY ARE GONE, THEY ARE GONE FOREVER! EACH CUSTOM COLLAGE IS INDIVIDUALLY LASER ENGRAVED ON THE NAMEPLATE WITH IT'S OWN SPECIFIC NUMBER IN THE 100 LIMITED EDITION RUN. NO COPIES WILL EXIST OF EACH SCRIPT PAGE AND YOU WILL BE THE RIGHTFUL OWNER OF THAT SPECIFIC SCRIPT PAGE FOREVER. THE SCRIPT HAS BEEN CUT AND SEPARATED INTO INDIVIDUAL PAGES AND PROFESSIONALLY CUSTOM FRAMED FOR THE ULTIMATE STAR WARS COLLECTOR!! THIS SPECIFIC LISTING IS FOR A RANDOM PAGE THAT DOES INCLUDE A PRINCESS LEIA SPEAKING LINE ON THE PAGE DISPLAYED OR ANY DIALOGUE INVOLVING PRINCESS LEIA ON THE PAGE. THIS LISTING WILL BE FOR A PAGE THAT HAS AT LEAST 1 SPEAKING LINE OR 1 LINE OF DIALOGUE OR 1 MENTION INVOLVING PRINCESS LEIA ON THE PAGE. WE ALSO HAVE PREMIUM PAGES AVAILABLE WHERE IT IS THE FIRST PAGE OF THE SCRIPT, LAST PAGE OF THE SCRIPT, #D1/100 OR #D100/100, FIRST AND LAST APPEARANCES OF HER CHARACTER IN THE SCRIPT, ETC. REMEMBER THE SCRIPT PAGE YOU RECEIVE WILL BE RANDOM. EACH SCRIPT PAGE WILL COME WITH A LETTER OF AUTHENTICITY FROM INSCRIPTAGRAPHS MEMORABILIA, GUARANTEEING THE PAGE IS AUTHENTIC. ON THIS LETTER, YOU WILL SEE AN ACTUAL PICTURE OF THE PAGE IN QUESTION AND PAGE NUMBER TO DIRECTLY CORRELATE THAT PAGE TO THIS LETTER OF AUTHENTICITY. 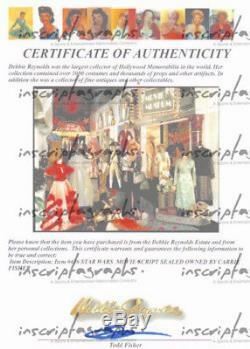 THE ITEM ALSO INCLUDES A COPY OF THE ORIGINAL CERTIFICATE OF AUTHENTICITY (ON THE BACKSIDE OF THE LETTER) ISSUED BY TODD FISHER, CARRIES BROTHER, WHO HAS PRESIDED OVER THE SALE OF PERSONAL ITEMS FOR HER AND HER MOTHER, DEBBIE REYNOLDS ESTATE. 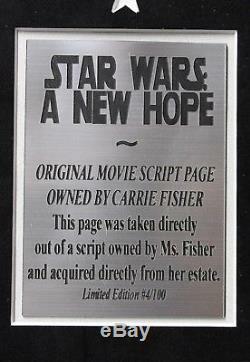 TODD SIGNED THE ORIGINAL PAPER GUARANTEEING THAT THE SCRIPT IS AUTHENTIC, WAS OWNED BY CARRIE FISHER AND DIRECTLY FROM HERS AND HER MOTHER'S ESTATE. IT DOES NOT GET ANY BETTER FOR AUTHENTICITY PURPOSES THAN OWNING AN ITEM DIRECTLY FROM HER ESTATE. THIS SCRIPT PAGE HAS BEEN PROFESSIONALLY CUSTOM FRAMED WITH MUSEUM QUALITY FRAMING MEASURING 19" X 36" IN SIZE THAT FEATURES A BLACK SLATE DESIGNER WOODEN FRAME. 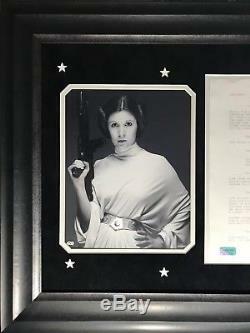 IT FEATURES 2 UNSIGNED 8X10 PHOTOS OF FISHER AS PRINCESS LEIA, A SILVER NAMEPLATE DEPICTING INFORMATION ABOUT THE SCRIPT PAGE WITH IT'S INDIVIDUALLY LASER ENGRAVED LIMITED EDITION NUMBER & AN OFFICIAL STAR WARS NEW HOPE MOVIE POSTER TRADING CARD. ALSO, THIS PIECE INCLUDES CUSTOM CUT STARS THROUGHOUT THE PIECE AND A GLASS DISPLAY! TO COMBAT DUPLICATION OF THE PAGE, WE HAVE MARKED EACH PAGE WITH A CONFIDENTIAL PROPRIETARY COMPANY MARKING TO DETER FRAUD. IN ADDITION, EACH PAGE HAS A SILVER TAMPERPROOF HOLOGRAM ON THE BOTTOM CORNER SIGNIFYING THAT THIS SPECIFIC PAGE IS AUTHENTIC AND NOT A REPRODUCTION. EACH HOLOGRAM HAS A UNIQUE CODE NUMBER ON IT WHERE YOU CAN GO ON OUR CERTIFICATE IF AUTHENTICITY DATABASE ON OUR WEBSITE AND VERIFY THE AUTHENTICITY OF THE PAGE 24/7/365. NOTE: THIS ITEM IS EXCLUDED FROM ALL DISCOUNTS AND PROMOTIONS BEING OFFERED. ALSO, THE MAKE ON OFFER OPTION WILL NOT BE AVAILABLE FOR THIS LISTING. 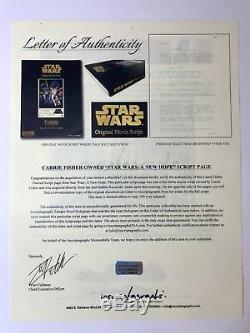 The item "CARRIE FISHER OWNED ORIGINAL STAR WARS NEW HOPE SCRIPT PAGE FRAMED ESTATE COA #1" is in sale since Friday, May 4, 2018. This item is in the category "Entertainment Memorabilia\Movie Memorabilia\Props\Originals". The seller is "inscriptagraphs" and is located in Las Vegas, Nevada. This item can be shipped to United States, Canada, United Kingdom, Denmark, Romania, Slovakia, Bulgaria, Czech republic, Finland, Hungary, Latvia, Lithuania, Malta, Estonia, Australia, Greece, Portugal, Cyprus, Slovenia, Japan, China, Sweden, South Korea, Indonesia, Taiwan, South africa, Thailand, Belgium, France, Hong Kong, Ireland, Netherlands, Poland, Spain, Italy, Germany, Austria, Israel, Mexico, New Zealand, Singapore, Switzerland, Norway, Saudi arabia, Ukraine, United arab emirates, Qatar, Kuwait, Bahrain, Croatia, Malaysia, Brazil, Chile, Colombia, Costa rica, Panama, Trinidad and tobago, Guatemala, Honduras, Jamaica, Barbados, Bangladesh, Bermuda, Brunei darussalam, Bolivia, Ecuador, Egypt, French guiana, Guernsey, Gibraltar, Guadeloupe, Iceland, Jersey, Jordan, Cambodia, Cayman islands, Liechtenstein, Sri lanka, Luxembourg, Monaco, Macao, Martinique, Maldives, Nicaragua, Oman, Peru, Pakistan, Paraguay, Reunion.